700 block of Hillsborough Street. October 2018. More renderings and plans are being submitted for the Heritage Properties developments along Hillsborough Street. 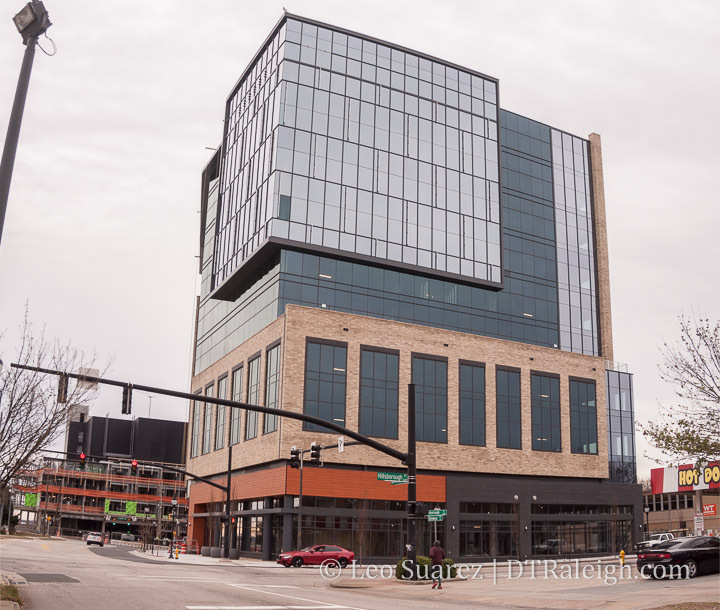 Readers might already be familiar with the soon-to-be-completed office tower, One Glenwood, and the second tower is coming soon with Two Hillsborough. The two towers will have a plaza in between, mid-block, with retail supporting a lively sense of place. The latest renderings show the two towers with the plaza in between. The collection of towers is being called Bloc 83 according to the latest submissions. 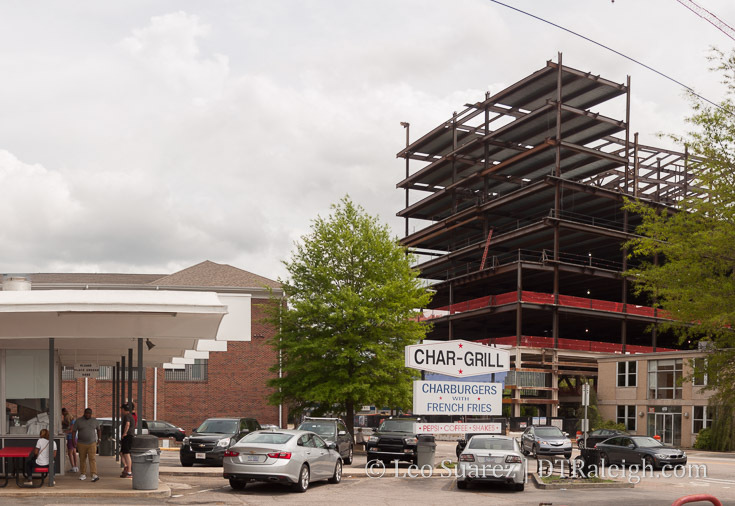 The third piece of the puzzle is a parking deck with ground-floor retail. Located on the 700 block of Hillsborough Street, the former auto shop and next-door house are slated to be removed for the new deck. The deck’s 693 spaces are most likely going to support Bloc 83. You can spy the deck in the renderings above. 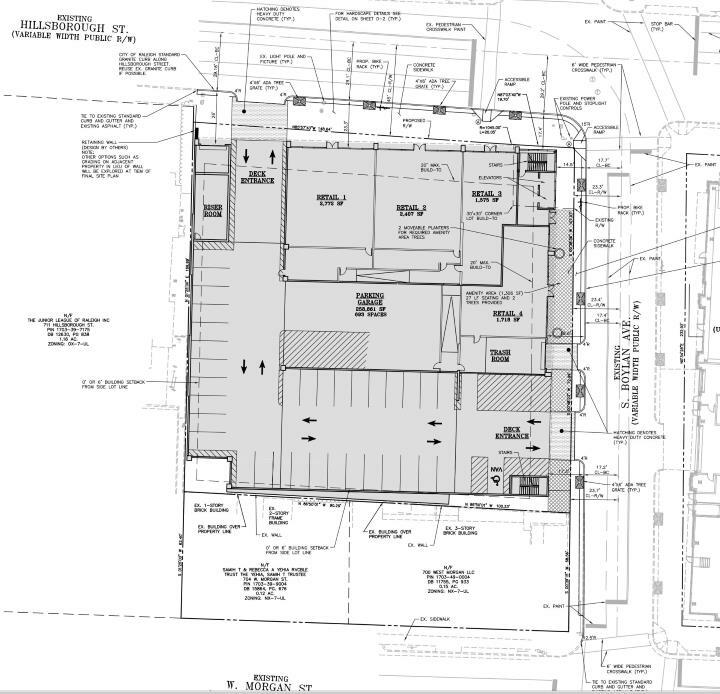 The site plan looks pretty typical but with retail along both Hillsborough Street and a part of Boylan. Entrances to the deck will be on both Hillsborough and Boylan Avenue. Below is a snapshot of that site plan. I can’t help but roll my eyes at more parking decks especially when you consider that one has already been built behind the Origin Hotel across Morgan by the same developers. I believe between the two decks there will over 1,000 spaces provided. 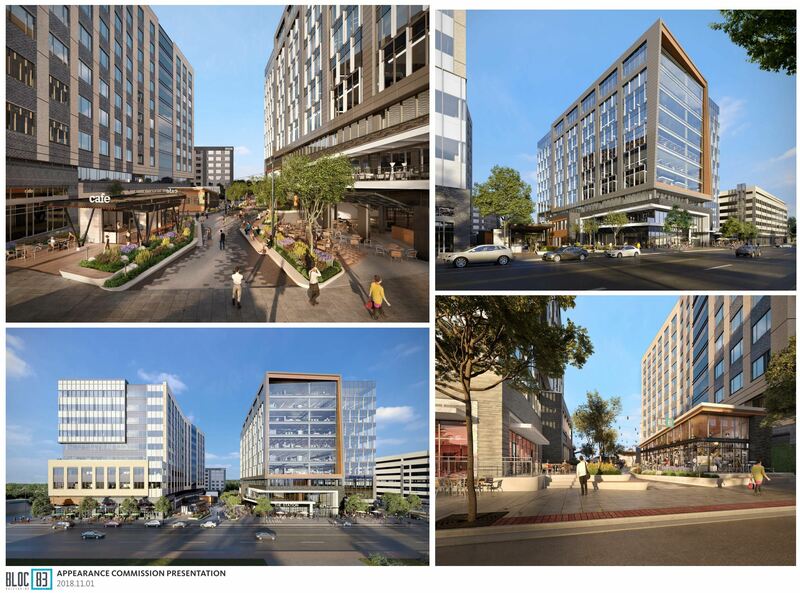 However, as I look at the plans and where we’re coming from, the new office towers moves the needle just a little bit towards a more urban and transit-friendly Raleigh. The parking decks are just a bridge that helps us connect to the rest of the region. The way retail space really surrounds the outside and inside of Bloc 83, even in the parking deck, feels hugely positive. If the landlords can land some service retail and add to downtown’s plentiful list of tasty places to eat then by all means, bring it on. 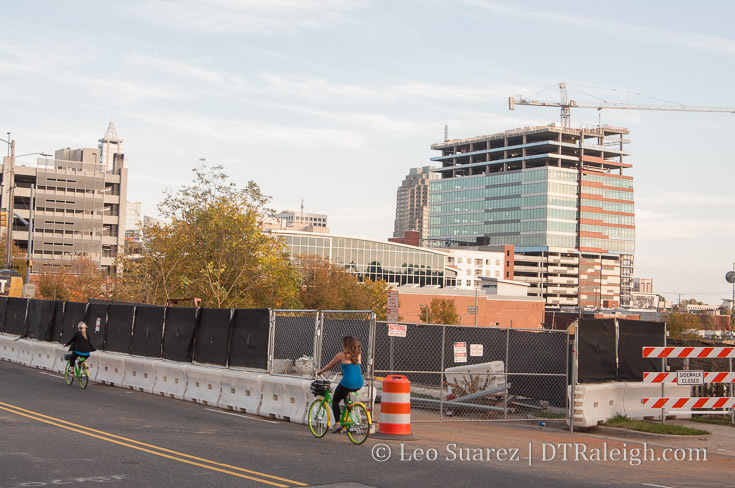 The vibe on the Community is a tad negative over another parking deck but does give more reason to support pro-transit and pro-bike orgs to keep the mobility options varied in and around downtown Raleigh. As for me, I’m seeing a future where I spend more time in this area compared to what was there and I think others may agree also. 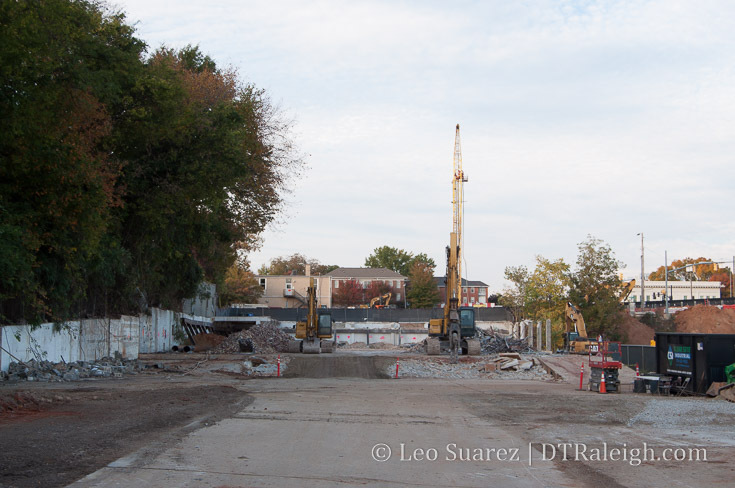 As One Glenwood wraps up over the next few months, I expect work on the rest of Bloc 83 to take place in 2019. One Glenwood is really coming along with the lower floors having their facade being put in place now. 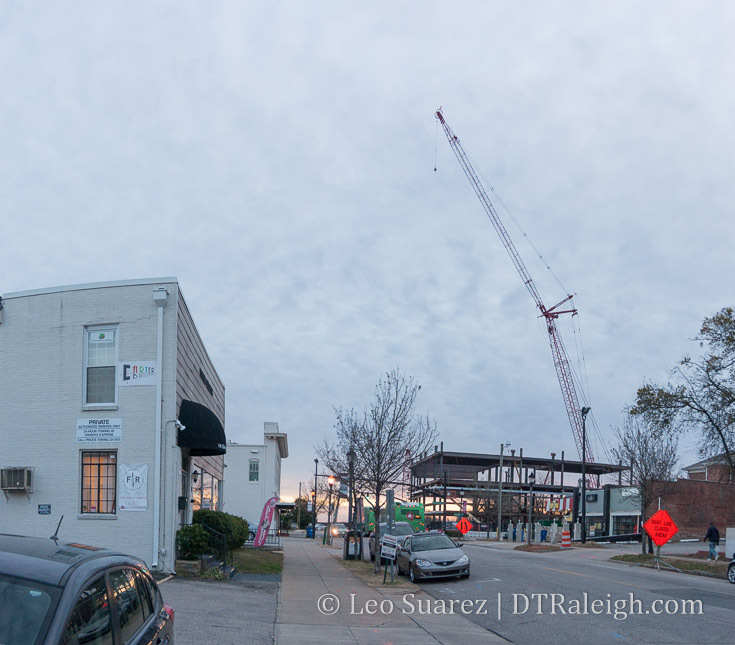 The parking deck, seen on the right from this angle, flew up and is giving Morgan Street an urban feel. At the pace I’m seeing, it seems the building will be ready by this Winter for sure. Join the discussion about One Glenwood on the DTRaleigh Community. Steel rises at the site of One Glenwood. February 2018. 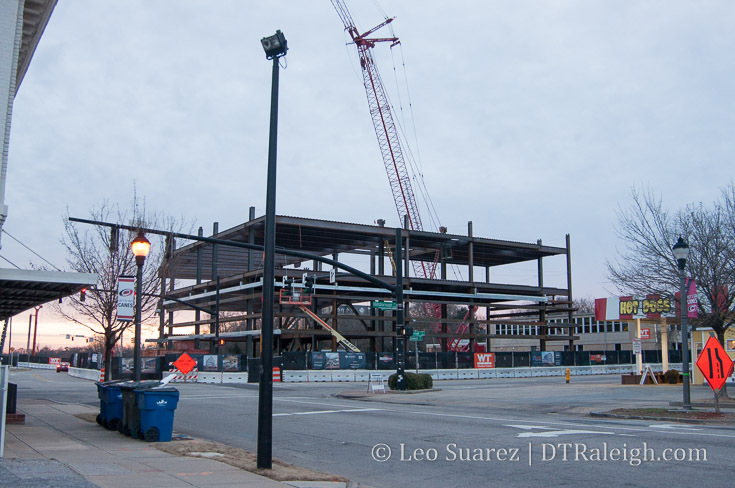 Steel is starting to take shape at the site of One Glenwood. This and the Origin Hotel planned for across Morgan Street are really going to create that bookend feeling for Glenwood South. This complements our earlier discussions around the nearby Willard Hotel at the corner of Willard Place and Glenwood Avenue also. 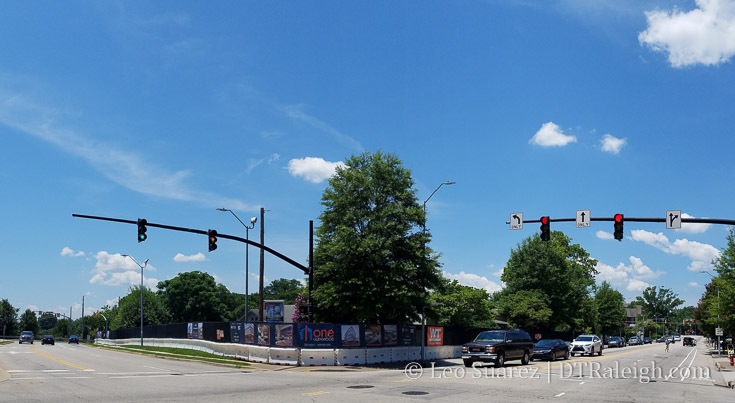 I actually like this zoomed-out image below as I think it shows how the end of Glenwood is going to get a nice urban presence which could bring more sidewalk activity to this area. Just use your imagination, or the crane, to put a 10-story building here. 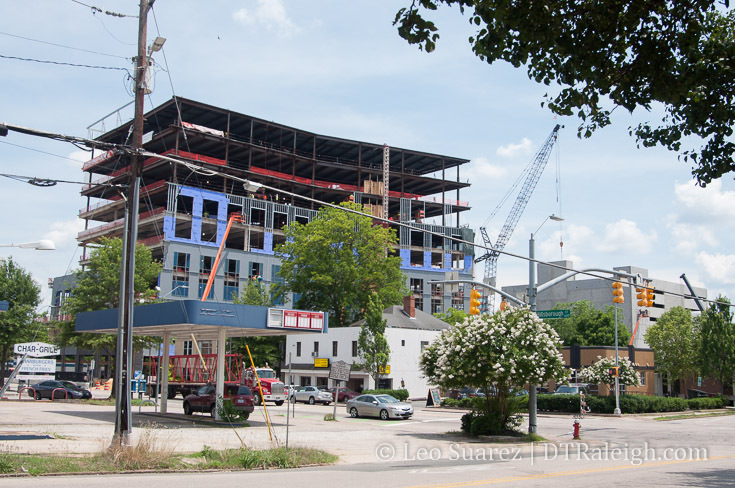 The site for One Glenwood has been cleared and from Hillsborough Street you can get a sense of the view the offices will have of the core business district and of the warehouse district. 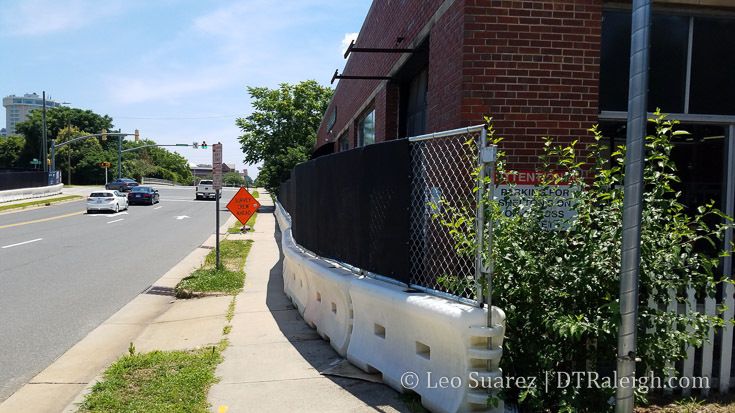 Construction fencing is in place along Glenwood Avenue between Hillsborough and Morgan Street. That probably means demolition will take place soon to make way for construction on One Glenwood, the 10-story office building with ground-floor retail. There’s also fencing along Morgan, across the street from the site, at the warehouse that used to house Shelton’s Furniture. Perhaps this site will also get demolished as well.